The Arkwright Society is a society established to complete the restoration and refurbishment of Cromford Mill near Matlock, Derbyshire, which is listed as a World Heritage Site. SLD, Godwin Pumps distributor in the UK, supplied the pumps needed to enable the refurbishment of Slinter Cottage further up the Via Gellia Valley. The cottage houses a waterwheel and is currently being restored as a visitor centre and a holiday cottage to raise further funds for the project. The project was to re-instate Slinter Mill pond, to enable use of the water wheel again, and involved the overpumping of its feeder stream, estimated to be some 7500 gpm, over a distance of approximately 170m. Due to the location of the site and restrictions for unloading and handling pipework, six Dri-Prime CD150M Hush-Pac units were deployed, coupled to bulk fuel tanks for continuous running. This enabled one unit to be consecutively shut down for service whilst maintaining the overpumping. 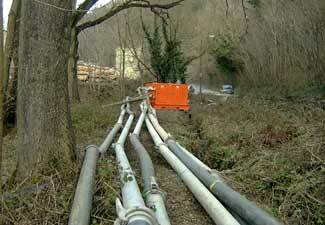 All pipework had to be installed by hand due to the amount of forestry in the area making vehicular access impossible. 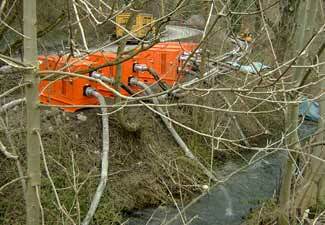 Whilst the overpumping was in operation, a new watercourse was created and the stream diverted. Repairs also were made to the waterwheel`s tail race and a new sluice gate installed to better control the level going to the main Mill. Once complete, the project will reduce the impact of mineral extraction in the area and the reinstated pond will act as a silt trap, thus keeping the watercourses downstream clear.